The Peoples Democratic Party, PDP, Monday, said the results being announced by the Independent National Electoral Commission, INEC, was unacceptable. It alleged that the whole results as being announced by the electoral umpire were doctored and largely manipulated by the presidency. National chairman of the party, Uche Secondus disclosed this while briefing newsmen in Abuja. He said the PDP was in possession of the whole original results from cross the country’s polling units. In his words, “Our democracy is under threat. We cannot accept the results as being announced by INEC. It is incorrect and unacceptable. “APC officials are working with the INEC officers to alter results earlier announced at various polling units in the country,” he said. 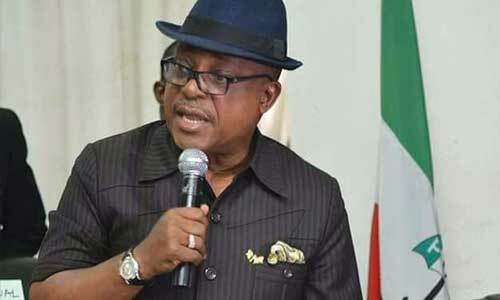 Secondus also alleged of falsification and manipulation of results through the instrumentality of the military, Police and operatives of the Department of State Services, DSS. Besides, PDP alleged that soon after the polls, the presidency sent out high-ranking officials of government to meet with various Resident Electoral Commissioners, RECs, to alter results in Kano, Kaduna, Nasarawa and many other states of the federation in favour of Buhari. Specifically, Secondus alleged that the presidency detailed the Attorney General and Minister of Justice, Abubakar Malami to the south East and South South, the Minister of Interior, Abdulrahman Dambazau was also accused to have influenced the results in the North West. Also, the Secretary to the government of the Federation, SGF, Boss Mustapha was allegedly sent to the North East. In his words, “High ranking government officials like the AGF was sent to doctor results in the south South and South East. “SGF- Mustapha was sent to the north east while the Minister of Interior, Dambazau was sent to the North West and part of North Central”.